When you enter a living room, if you do not see a coffee table you have the feeling that the room is not finished. It is similar to a supermodel who does not wear lipstick, it is one detail that completes the look, so you have to make sure that you find the perfect table to suit the design of your house. A coffee table would serve multiple purposes, because it can be used to display and store different items and it will complete the look of the living room. However, your main question may be what style would work for your space, because there are so many models available online. Should you opt for a metallic one with glass top, wood one with bold legs as the ones from Skovby Living, or should you look for a more modern model? Also, you will have to decide upon the form of the table, because they come in square, round and rectangular shapes. You have endless options when it comes to coffee tables and this can be overwhelming if you do not have experience in buying furniture. 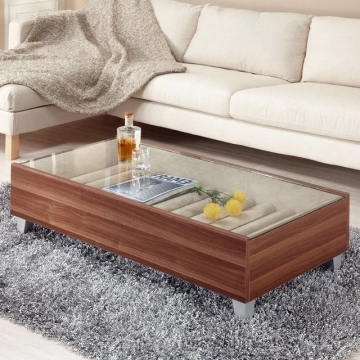 If you take a look online, you will notice that when it comes to coffee tables you will find items listed at budget friendly prices, but also ultra-expensive ones. So you will have to consider the budget when you want to buy a coffee table, because if you want to furnish the entire house, then you may have to break down the budget to also buy accessories and lighting. The bigger part of the budget you will have to spend on the main furniture items as side tables, sofa, and chairs. But this does not mean that you should not allocate a big part of your budget to the coffee table if you want to bring the focus on this item. As you plan the design of the room, you should try to imagine what shape of table you see alongside the items you have already purchased. Also, you have to ask yourself some questions. Do you have any pets or children? It is a narrow, small or large room? In case you have pets or kids around the house, you should opt for an oval or round table, because it is a safe furniture item. You have to determine what size is suitable for your room. Also, do not skip from view to check the height. It is recommended to purchase a coffee table that is no lower than 1-2 inches from the height of the sofa. On the market, you will notice that the majority of coffee tables are around 16-18 inches and they can be placed together with a typical sized couch. In case you want to purchase a higher sofa, then you should consider buying a taller table, and you should look on the market for one of 20-21 inches. If the coffee table is taller, then you will find it convenient, and easier to set down the plates and glasses.